"Cotswold" redirects here. For other uses, see Cotswold (disambiguation). "Cotswold Hills" redirects here. For the suburb of Toowoomba, Queensland, see Cotswold Hills, Queensland. The Cotswolds (/ˈkɒtswoʊldz/ KOTS-wohldz, /-wəldz/ -⁠wəldz) is an area in south central England comprising the Cotswold Hills, a range of rolling hills that rise from the meadows of the upper Thames to an escarpment, known as the Cotswold Edge, above the Severn Valley and Evesham Vale. The area is defined by the bedrock of Jurassic limestone that creates a type of grassland habitat rare in the UK and that is quarried for the golden-coloured Cotswold stone. It contains unique features derived from the use of this mineral; the predominantly rural landscape contains stone-built villages, historical towns and stately homes and gardens. There is evidence of Neolithic settlement from burial chambers on Cotswold Edge, and there are remains of Bronze and Iron Age forts. Later the Romans built villas, such as at Chedworth, settlements such as Gloucester, and paved the Celtic path later known as Fosse Way. During the Middle Ages, thanks to the breed of sheep known as the Cotswold Lion, the Cotswolds became prosperous from the wool trade with the continent, with much of the money made from wool directed towards the building of churches. The most successful era for the wool trade was 1250–1350; much of the wool at that time was sold to Italian merchants. The area still preserves numerous large, handsome Cotswold Stone "wool churches". The affluent area in the 21st century has attracted wealthy Londoners and others who own second homes there or have chosen to retire to the Cotswolds. The name Cotswold is popularly attributed the meaning "sheep enclosure in rolling hillsides", incorporating the term, wold, meaning hills. Compare also the Weald from the Saxon/German word Wald meaning 'forest'. However, the English Place-Name Society has for many years accepted that the term Cotswold is derived from Codesuualt of the 12th century or other variations on this form, the etymology of which was given, 'Cod's-wold', which is 'Cod's high open land'. Cod was interpreted as an Old English personal name, which may be recognised in further names: Cutsdean, Codeswellan, and Codesbyrig, some of which date back to the eighth century AD. It has subsequently been noticed that "Cod" could derive philologically from a Brittonic female cognate "Cuda", a hypothetical mother goddess in Celtic mythology postulated to have been worshipped in the Cotswold region. The spine of the Cotswolds runs southwest to northeast through six counties, particularly Gloucestershire, west Oxfordshire and south western Warwickshire. The northern and western edges of the Cotswolds are marked by steep escarpments down to the Severn valley and the Warwickshire Avon. This feature, known as the Cotswold escarpment, or sometimes the Cotswold Edge, is a result of the uplifting (tilting) of the limestone layer, exposing its broken edge. This is a cuesta, in geological terms. The dip slope is to the southeast. On the eastern boundary lies the city of Oxford and on the west is Stroud. To the southeast, the upper reaches of the Thames Valley and towns such as Lechlade, Tetbury and Fairford are often considered to mark the limit of this region. To the south the Cotswolds, with the characteristic uplift of the Cotswold Edge, reach beyond Bath, and towns such as Chipping Sodbury and Marshfield share elements of Cotswold character. The area is characterised by attractive small towns and villages built of the underlying Cotswold stone (a yellow oolitic limestone). This limestone is rich in fossils, particularly of fossilised sea urchins. Cotswold towns include Bourton-on-the-Water, Broadway, Burford, Chipping Norton, Cricklade, Dursley, Malmesbury, Moreton-in-Marsh, Nailsworth, Northleach, Stow-on-the-Wold, Stroud, Witney and Winchcombe. Bath, Cheltenham, Cirencester, Gloucester, Stroud and Swindon are larger urban centres that border on, or are virtually surrounded by, the Cotswold AONB. Many travel guides direct tourists to Chipping Campden, Stow-on-the-Wold, Bourton-on-the-Water, Broadway, Worcestershire, Bibury, and Stanton. Some of these locations can be very crowded at times. Roughly 300,000 people visit Bourton per year, for example, with about half staying for a day or less. Lower Slaughter, "home to honey-coloured stone architecture, quaint little cottages and the most romantic street in Britain, Copse Hill Road". Mickleton, Gloucestershire, with an "abundance of black and white thatched cottages interspersed with limestone architecture - creating a picture perfect Cotswold scene". Ashton under Hill, with its history going back to the Roman occupation, "scattered with cosy timber-framed cottages and pretty Victorian houses". The area also has numerous public walking trails and footpaths that attract visitors, including the 93-mile Cotswold Way (part of the National Trails System) from Bath to Chipping Camden. Cotswold stone is a yellow oolitic Jurassic limestone. This limestone is rich in fossils, particularly of fossilised sea urchins. When weathered, the colour of buildings made or faced with this stone is often described as honey or golden. The stone varies in colour from north to south, being honey-coloured in the north and north east of the region, as shown in Cotswold villages such as Stanton and Broadway; golden-coloured in the central and southern areas, as shown in Dursley and Cirencester; and pearly white in Bath. The rock outcrops at places on the Cotswold Edge; small quarries are common. The exposures are rarely sufficiently compact to be good for rock-climbing, but an exception is Castle Rock, on Cleeve Hill, near Cheltenham. Due to the rapid expansion of the Cotswolds in order for nearby areas to capitalize on increased house prices, well known ironstone villages, such as Hook Norton, have even been claimed by some to be in the Cotswolds despite lacking key features of Cotswolds villages such as Cotswold stone and are instead built using a deep red/orange ironstone, known locally as Horton Stone. 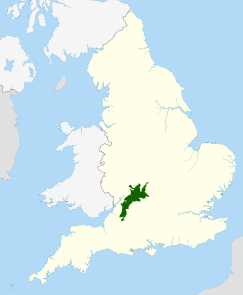 The Cotswolds were designated as an Area of Outstanding Natural Beauty (AONB) in 1966, with an expansion on 21 December 1990 to 1,990 square kilometres (768 sq mi). In 1991, all AONBs were measured again using modern methods. The official area of the Cotswolds AONB was increased to 2,038 square kilometres (787 sq mi). In 2000, the government confirmed that AONBs had the same landscape quality and status as National Parks. The Cotswolds AONB, which is the largest in England and Wales, stretches from the border regions of South Warwickshire and Worcestershire, through West Oxfordshire and Gloucestershire, and takes in parts of Wiltshire, Bath and North East Somerset in the south. Gloucestershire County Council is responsible for sixty-three percent of the AONB. In the summer of 2018, the final draft of the Cotswolds AONB Management Plan 2018–2023 was out for consultation. The final text should be written after 14 August 2018. The Cotswolds Conservation Board has the task of conserving and enhancing the AONB. Established under statute in 2004 as an independent public body, the Board carries out a range of work from securing funding for 'on the ground' conservation projects, to providing a strategic overview of the area for key decision makers, such as planning officials. The Board is funded by Natural England and the seventeen local authorities that are covered by the AONB. While the beauty of the Cotswolds AONB is intertwined with that of the villages that seem almost to grow out of the landscape, the Cotswolds were primarily designated an Area of Outstanding Natural Beauty for the rare limestone grassland habitats as well as the old growth beech woodlands that typify the area. These habitat areas are also the last refuge for many other flora and fauna, with some so endangered that they are protected under the Wildlife and Countryside Act 1981. Cleeve Hill, and its associated commons, is a fine example of a limestone grassland and it is one of the few locations where the Duke of Burgundy butterfly may still be found in abundance. A June 2018 report stated that the AONB receives "23 million visitors a year, the third largest of any protected landscape". Earlier that year, Environment secretary Michael Gove announced that a panel would be formed to consider making some of the AONBs into National Parks. The review will file its report in 2019. In April 2018, the Cotswolds Conservation Board had written to Natural England "requesting that consideration be given to making the Cotswolds a National Park", according to Liz Eyre, Chairman. This has led to some concern as stated by one member of the Cotswold District Council, "National Park designation is a significant step further and raises the prospect of key decision making powers being taken away from democratically elected councillors". In other words, Cotswold District Council would no longer have the authority to grant and refuse housing applications. The uniqueness and value of the Cotswolds is shown in the fact that five European Special Areas of Conservation, three National Nature Reserves and more than eighty Sites of Special Scientific Interest are within the Cotswolds AONB. The Cotswold Way is a long-distance footpath, just over 100 miles (161 km) long, running the length of the AONB, mainly on the edge of the Cotswold escarpment with views over the Severn Valley and the Vale of Evesham. Pictured right is the Garden of Sudeley Castle at Winchcombe. The present structure was built in the 15th century and may have been on the site of a 12th-century castle. It is situated north of the Spa town of Cheltenham which has much Georgian architecture of some merit. Close by on the A4135 in Beaverston village is the ancient fortress known as Beverston Castle founded in 1229 by Maurice de Gaunt. Within the Cotswold area lies Calcot Manor which can be accessed on the A4135 road from Beaverston and is located some 4 miles (6 km) west of Tetbury. The Manor house building was established in about 1300 AD by Henry of Kingswood as a tithe barn. Tetbury Market House was built in 1655. During the Middle Ages, Tetbury became an important market for Cotswold wool and yarn. Chavenage House is an Elizabethan-era manor house 1.5 miles (2.4 km) northwest of Tetbury. Of some interest is Chedworth Roman Villa. Recent excavations have revealed more of the structure and mosaics, which are now excellently presented. It is located just off the Roman road known as the Fosse Way, and 8 miles (13 km) north of the important town of Corinium Dobunnorum (Cirencester). Cirencester Abbey was founded as an Augustinian monastery in 1117 and Malmesbury Abbey was one of the few English houses with a continual history from the 7th century through to the Dissolution of the Monasteries. An unusual house in this area is Quarwood, a Victorian Gothic house in Stow-on-the-Wold, Gloucestershire. The grounds, covering 42 acres (17 ha), include parkland, fish ponds, paddocks, garages, woodlands and seven cottages. Another is Woodchester Mansion, an unfinished, Gothic revival mansion house in Woodchester Park near Nympsfield in Woodchester, Gloucestershire. Newark Park is a Grade I listed country house of Tudor origins located near the village of Ozleworth, Wotton-under-Edge, Gloucestershire. The house sits in an estate of 700 acres (300 ha) at the southern end of the Cotswold escarpment. Of the many Manor houses built in the area Owlpen Manor is a Tudor Grade I listed manor house of the Mander family, situated in the village of Owlpen in the Stroud district of Gloucestershire. Moving further north, Broadway Tower is a folly on Broadway Hill, near the village of Broadway, in the English county of Worcestershire. To the south of the Cotswolds is Corsham Court an English country house in a park designed by Capability Brown situated in the town of Corsham, 3 miles (4.8 km) west of Chippenham, Wiltshire. The Cotswolds lie between the M5, M40 and M4 motorways. The main A-roads through the area are the A46: Bath – Stroud – Cheltenham; the A419: Swindon – Cirencester – Stroud; the A429: Cirencester – Stow-on-the-Wold – Moreton-in-Marsh; and the A40: Oxford – Burford – Cheltenham. These all roughly follow the routes of ancient roads, some laid down by the Romans, such as Ermin Way and the Fosse Way. The River Thames flows from the Cotswolds and is navigable from Inglesham and Lechlade-on-Thames downstream to Oxford. The area is bounded by two major rail routes: in the south by the main Bristol–Bath–London High Speed line (including the South Wales Main Line) and in the west by the Bristol–Birmingham main line. In addition, the Cotswold Line runs through the Cotswolds from Oxford to Worcester, and the Golden Valley Line runs from Swindon via Stroud to Gloucester, carrying high speed and local services. Mainline, high-speed rail services to the big cities run from railway stations such as Bath, Swindon, Oxford, Cheltenham and Worcester. Mainline trains run by Great Western Railway to London Paddington also are available from Kemble station near Cirencester, Kingham station near Stow-on-the-Wold, Charlbury station and Moreton-in-Marsh station. Additionally, there is the Gloucestershire Warwickshire Railway, a steam heritage railway serving the Cotswolds from Cheltenham Racecourse through Gotherington, Winchcombe and Hayles Abbey Halt to Toddington and Laverton. The preserved line is currently being extended to Broadway, with the aim of reaching Honeybourne and making a reconnection with the Cotswold Line. The Cotswold region has inspired several notable English composers. In the early 1900s, Herbert Howells and Ivor Gurney used to take long walks together over the hills, and Gurney urged Howells to make the landscape, including the nearby Malvern Hills, the inspiration for his future work. Accepting, in 1916, Howells wrote his first major piece, the Piano Quartet in A minor, inspired by the magnificent view of the Malverns; he dedicated it to "the hill at Chosen (Churchdown) and Ivor Gurney who knows it". Another contemporary of theirs, Gerald Finzi, lived in nearby Painswick. Gustav Holst titled his Symphony in F major, Op. 8 H47 The Cotswolds. The composer Ralph Vaughan Williams composed his opera "Hugh the Drover" from 1913 to 1924, which depicts life in a Cotswold village and incorporates local folk melodies. In 1988 the 6th symphony (Op. 109) of composer Derek Bourgeois was titled "A Cotswold Symphony". The Cotswolds are a popular location for filming scenes for movies and television programmes. The film Better Things (2008), directed by Duane Hopkins, is set in a small Cotswold village. The fictional detective Agatha Raisin lives in the fictional village of Carsely in the Cotswolds. The Chipping Norton set are based in the Cotswolds. Other movies filmed in the Cotswolds or nearby, at least in part, include some of the Harry Potter Series (Gloucester Cathedral), Bridget Jones's Diary (film) (Snowshill), Pride and Prejudice (Cheltenham Town Hall) and Braveheart (Cotswold Farm Park). In 2014, some scenes of the 2016 movie Alice in Wonderland: Through the Looking Glass were filmed at the Gloucester Docks just outside the Cotswold District; some scenes for the 2006 movie Amazing Grace were also filmed at the Docks. The television series Father Brown was almost entirely filmed in the Cotswolds. 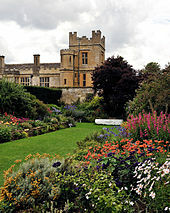 Scenes and buildings in Sudeley Castle was often featured in the series. The vicarage in Blockley was used for the main character's residence while St. Peter and St. Paul church was the Roman Catholic St. Mary’s in the series. Other filming locations included Guiting Power, the former hospital in Moreton-in-Marsh, the Winchcombe railway station, Lower Slaughter and St Peter's Church in Upper Slaughter. Many exterior shots of village life in the Downton Abbey TV series were filmed in Bampton, Oxfordshire. Other filming locations in that county included Swinbrook, Cogges and Shilton. The city of Bath hosted crews that filmed parts of the movies Vanity Fair, Persuasion, Dracula and The Duchess. Gloucester and other places in Gloucestershire, some within the Area of Natural Beauty, have been a popular location for filming period films and television programmes over the years. Gloucester Cathedral has been particularly popular. ^ "Cotswolds". Dictionary.com. Random House. Retrieved 7 March 2018. ^ "Cotswolds – an Area of Outstanding Natural Beauty". cotswoldsaonb.org.uk. Cotswolds Conservation Board. Archived from the original on 4 August 2014. ^ "Cotswold District Council - Cotswolds AONB". www.cotswold.gov.uk. ^ "Where is the Cotswolds - Visitors Guide Fact Sheet". www.cotswolds.info. ^ "Moves made for The Cotswolds to become a National Park - Stratford Herald". 17 May 2018. ^ "Hill Bagging: Cleeve Hill". Hill Bagging: the online version of the Database of British and Irish Hills. Archived from the original on 16 July 2015. Retrieved 14 July 2015. ^ "Cotswold District Council - About the Council". www.cotswold.gov.uk. ^ "Cotswold District Council - Cotswold factfile". www.cotswold.gov.uk. ^ "Census data" (PDF). www.cotswold.gov.uk. 2011. ^ a b "Cotswolds.com - The Official Cotswolds Tourist Information Site". www.cotswolds.com. ^ a b "In Deep: Idyllic England in the Cotswolds - Butterfield & Robinson". 14 August 2017. ^ a b "Fact sheet" (PDF). www.cotswoldsaonb.org.uk. 2017. ^ Carolione Mills (15 April 2011). Slow Cotswolds. Bradt Travel Guides. p. vii. Archived from the original on 18 January 2017. ^ Andrew McCloy, Andrew Midgley (2008). Discovering Roman Britain. New Holland Publishers. p. 90. Archived from the original on 18 January 2017. ^ Hayley Dixon (9 October 2013). "'Roman' roads were actually built by the Celts, new book claims". The Telegraph. Archived from the original on 4 May 2014. ^ "The Kingscote, Gloucestershire area". Kingscote Park. Archived from the original on 26 April 2012. Retrieved 1 January 2012. ^ Charnock, Richard Stephen (1859). Local etymology: a derivative dictionary of geographical names. Houlston and Wright. p. 76. Archived from the original on 1 January 2014. ^ a b "Cotswold Stone". Cotswold Gateway. Archived from the original on 15 December 2009. Retrieved 12 December 2009. ^ "Broadway Tower". Cotswold website. Archived from the original on 8 July 2009. Retrieved 12 December 2009. ^ "Origins of Robert Dover's Games". Olympick Games. Archived from the original on 2 December 2009. Retrieved 12 December 2009. ^ "Farming - Cotswolds AONB". ^ "Cotswold District Council - Census 2011". www.cotswold.gov.uk. ^ a b "Cotswold District Council - Cotswold factfile". www.cotswold.gov.uk. ^ "Decrease in unemployment in the Cotswolds". Wilts and Gloucestershire Standard. ^ "Cotswold District Council - New report highlights boom time for tourism in Cotswolds". www.cotswold.gov.uk. ^ "England's Cute and Cozy Cotswolds by Rick Steves". www.ricksteves.com. 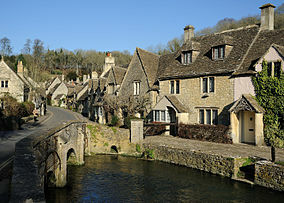 ^ "The Top Five Best Cotswold Villages to Visit - CotswoldJourneys.com". www.cotswoldjourneys.com. ^ Garnett, Daisy. "The Quintessential Guide to the Cotswolds". ^ Romero, Kat (22 January 2016). "Cotswolds village TOO POSH for buses? Coaches officially BANNED". ^ Cooper, Hayley. "Cotswold villages: 10 of the prettiest places to visit". ^ "7 Best Walks And Trails In The Cotswolds". TRIP101 Pte Ltd. 25 May 2017. Retrieved 12 January 2019. The Cotswolds are quite simply a hiker's paradise. Miles upon miles of public pathways and bridleways to explore. ^ "10,000 homes will be built across Cotswolds". Wilts and Gloucestershire Standard. ^ "Cotswold stone". cotswold.gov.uk. Cotswold District Council. Archived from the original on 23 March 2014. ^ "Hornton Stone". 3 September 2013. ^ "AONB". Cotswolds AONB. Archived from the original on 4 August 2014. Retrieved 12 December 2009. ^ "Cotswolds AONB Management Plan - Cotswolds AONB". ^ "Cotswolds Conservation Board". Cotswolds AONB. Archived from the original on 31 January 2009. Retrieved 12 December 2009. ^ "Landscape data" (PDF). www.cotswoldsaonb.org.uk. 2017. ^ "Natural Areas – 55 Cotswolds". Natural England. Archived from the original on 24 July 2011. Retrieved 6 May 2011. ^ "MP seeks to meet new chief in bid to promote idea of Cotswolds becoming a National Park". Cotswold Journal. ^ "England could have new national parks". 27 May 2018 – via www.bbc.com. ^ "England's Protected Landscapes to be reconsidered under new review - Cotswolds AONB". 29 May 2018. ^ "Cotswold District Council - Council will undertake evaluation of potential National Park designation". www.cotswold.gov.uk. ^ Boobyer, Leigh (21 June 2018). "Gloucestershire could be about to get a national park". ^ "Understanding the Cotswold AONB". Cotswolds Area of Outstanding Natural Beauty. Archived from the original on 4 August 2014. Retrieved 6 May 2011. ^ "101 Reasons to Love the Cotswolds, Cotswold Voluntary Wardens". www.lovingthecotswolds.com. ^ "Cotswold Way – About this trail". National Trail. Archived from the original on 13 November 2013. Retrieved 14 July 2015. ^ "Sudeley Castle". Heritage Gateway. Historic England. Archived from the original on 23 November 2015. Retrieved 22 November 2015. ^ "Beverstone Castle". Castle UK. Archived from the original on 22 November 2015. Retrieved 22 November 2015. ^ "Calcot Manor". Calcot Manor. Archived from the original on 27 November 2015. Retrieved 22 November 2015. ^ "Calcot Manor's impressive heritage". Calcot Manor. Archived from the original on 23 November 2015. Retrieved 22 November 2015. ^ "Market House, Tetbury". Heritage Open Days. Archived from the original on 23 November 2015. Retrieved 22 November 2015. ^ "Chavenage House". Historic Houses Association. Archived from the original on 22 November 2015. Retrieved 22 November 2015. ^ Page, William. "Houses of Augustinian canons: The abbey of Cirencester". British History Online. Victoria County History. Archived from the original on 22 November 2015. Retrieved 22 November 2015. ^ Pugh, R. B.; Critall, Elizabeth. "House of Benedictine monks: Abbey of Malmesbury". British History Online. Victoria County Histories. Archived from the original on 15 September 2015. Retrieved 22 November 2015. ^ "Quar Wood, Gloucestershire". Victorian Web. Archived from the original on 25 December 2015. Retrieved 22 November 2015. ^ "Woodchester Park". National Trust. Archived from the original on 22 November 2015. Retrieved 22 November 2015. ^ "Historic Places to Visit". cotswolds.info. Cotswolds.Info LLP. 2015. Retrieved 14 July 2015. ^ "The 15 Best Things to Do in Cotswolds 2018 - Must See Attractions in Cotswolds, England | TripAdvisor". Tripadvisor.ca. Retrieved 18 July 2018. ^ Long Remembered Hills Archived 19 September 2012 at the Wayback Machine How the English composers Ivor Gurney and Herbert Howells were influenced by the Gloucestershire countryside. ^ a b Meredith, Joe. "19 famous filming locations in the Cotswolds". ^ "The Cotswolds on Film - TV". www.lovingthecotswolds.com. ^ a b "Popular Films and TV filmed in the Cotswolds". ^ "The Cotswolds on Film - Movies". www.lovingthecotswolds.com. ^ "Where's BBC's Father Brown filmed in the Cotswolds?". ^ "TV series filmed in Cotswolds". Cotswold Journal. ^ "Downton Abbey film locations - Oxfordshire Cotswolds". www.oxfordshirecotswolds.org. ^ "'Father Brown' is loving Cotswolds". Cotswold Journal. ^ "Cotswolds Filming Locations Cinema & TV". www.cotswolds.info. ^ SoGlos. "18 movie and television filming locations in Gloucestershire". SoGlos. 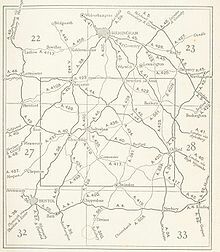 Wikisource has the text of the 1911 Encyclopædia Britannica article Cotteswold Hills.